Why do people drive like this in movies? Have they never driven a car before? Or seen how a car is handled in real life? Imagine how that kind of driving would look like. 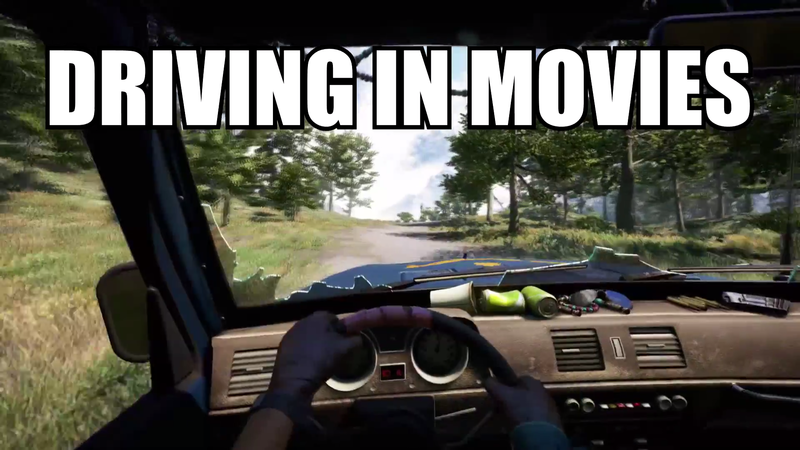 The GIF above is from Far Cry 4, which isn’t exactly a car simulator, but it would probably go along those lines in real life. If you have a pet, this spastic driving would make it never jump in a car again. It is a lot of wasted energy driving a car like this, and think of the damage it will do to your car! The car, man! You probably won’t end up at your intended destination. Even when going down a straight road. The same phenomenon appears to happen when an actor who has never touched a video game pretends to do so in a movie or series. Lou Ferrigno, the incredible hulk, gets an A for effort here. I’m pressing all the buttons at the same time. THIS IS SO INTENSE! In many cases it is probably intentional overacting to make it clear to the viewer what they are doing. Unless for comedic effect, take it down a notch, perhaps? Perhaps they’re drunk or waaay out of their heads on cocaine. But it’s probably over acting. It’s like Charlie Sheen playing a video game in his “golden days” (white snow days? ).